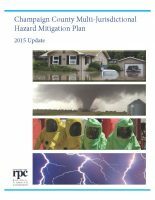 In 2014, Champaign County and the Illinois Emergency Management Agency agreed to develop an updated version of the 2009 Hazard Mitigation Plan. RPC Planning and Community Development staff began the update in June 2014. Champaign County, all municipalities wholly or partially within the county, the University of Illinois at Urbana-Champaign, and Parkland College are participating in the update, which is expected to continue through June 2015. Public participation is invited throughout the project. For additional information, please visit the Champaign County Multi-Jurisdictional Hazard Mitigation Plan website.